This week is Paramedic and Emergency Medical Services Week, and several Hamilton paramedics are being recognized for going above and beyond the call of duty. Hamilton paramedics and emergency services say they are happy to "finally" be getting recognition for their work in the community. 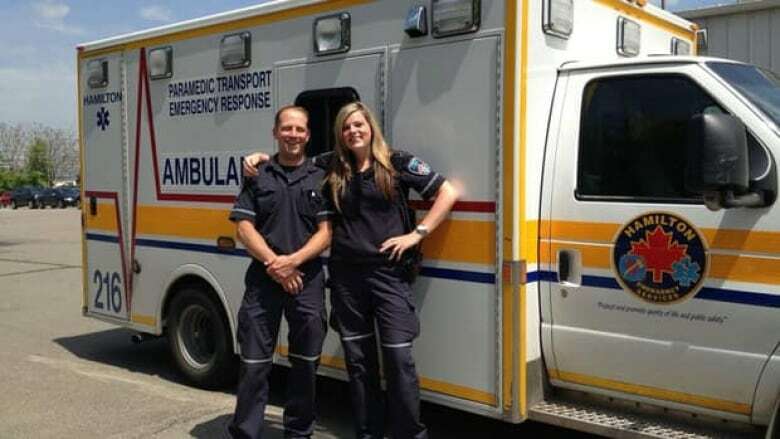 This week is Paramedic and Emergency Medical Services Awareness Week, and the Hamilton Paramedic Service is drawing attention to several local medics who have won awards and commendations for their efforts in the community. Mike North pulled an injured woman out of an overturned, burning vehicle. That heroic act won North the Governor General of Canada Certificate of Commendation. The commendation is given to people who perform notably selfless acts. North was off-duty in December of 2006 when the incident happened. "I was just leaving a hockey rink with my two sons at the time after a hockey practice, and we saw a car travelling down Barton Street at a very high speed," recalled North. They were heading home in the same direction and came across the scene of a violent accident involving two cars, one of which was on fire. "There were people and car parts everywhere," said North. "It was one of those moments where you try and you do what you can." North called for emergency services and, while waiting for them to arrive, crawled inside the burning vehicle to rescue the trapped woman inside. Despite rescuing her from the vehicle, North said the woman died of her injuries later on. David Donais, supervisor of emergency services in Hamilton, said it took six years for North to receive recognition for his actions. Donais said this process does not usually take as long for firefighters or police to be recognized for similar achievements. "It was just sitting there in limbo," said Donais, referring to North's recommendation for the Governor General's commendation. "They just kept on shuffling it to the bottom of the pile every time they'd get together to review these things. I kept being told, 'It's going to be on the next review. It's going to be on the next review.'" Donais said that the struggle for recognition for notable achievements is very frustrating for paramedics. "The medics are out there doing stuff that's not part of their job description," said Donais, adding that paramedics are not trained for many of the dangerous situations they can find themselves in. Hamilton paramedic Vanessa Meulendyks was awarded for her achievements as well, receiving the N.H. McNally Award of Bravery for her actions during a call in February of 2012. Meulendyks and her partner, Mandie Purdy, rescued an injured man from his burning apartment, even though this put them in danger. "We took a peek in and noticed that the man was paraplegic," said Meulendyks. "So at that point, my partner and I dragged him out and brought him to safety." Meulendyks said she was excited to receive the award, especially since she had only been a paramedic for a year when the incident occurred. "It's nice that paramedics are finally being recognized here out on the street," said Meulendyks. "Generally, we don't really have a lot of public relations, so it's just nice to be honoured and awarded for something that would normally go unrecognized." She added that being a paramedic in Hamilton is rewarding because she grew up in the community. "You feel a lot closer to the community because it's where you live, you kind of know what's going on," said Meulendyks. "I've always wanted to work here, ever since high school, so it's a bit of a dream come true." During the past year and a half, eight Hamilton paramedics, including North and Meulendyks, have been recognized provincially and nationally for exemplary actions.